- If you want to vote strategically, it may be a good idea to wait until Election Day. If you have to vote early, do it, but understand that today's advice may be irrelevant or even counterproductive come October 19. I will be posting an updated guide on the eve of Election Day. - Follow the advice below at your own risk and peril. I make no guarantee that this advice is correct. In fact, there will almost certainly be a few ridings where it is wrong. (Though, hopefully, it will be right in most cases.) So don't complain to me if things don't work out! There are actually three strategic considerations for anti-Harper voters, and they sometimes conflict. 1. Vote to defeat the Conservative candidate at the riding level. 2. Vote for the party most likely to beat the Conservative seat count. 3. Vote for the party most likely to beat the Conservative popular vote. People sometimes dismiss the popular vote as meaningless in our system. 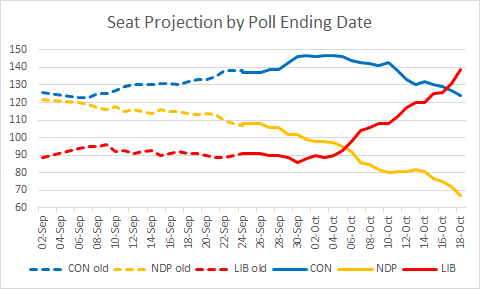 However, this time, it may be important post-election: if the Tories win the seat count, it'd be much easier for Justin Trudeau to claim legitimacy to govern if he wins the popular vote. This means that the Governor General may be more likely to give Trudeau a chance to form government (instead of calling a new election) after the rejection of a Conservative Throne Speech if the Liberals win the popular vote. If the only relevant strategic consideration for you is #3 (e.g. you live in a non-competitive riding and care about the popular vote), you do not need a guide: vote Liberal. As you can see, the advice is heavily skewed towards the Liberals, but that's entirely due to Ontario. Outside Ontario, the Liberal and NDP overall popular support levels are similar, so as one would expect, the strategic voting advice splits roughly evenly. The other interesting observation is that Québec is a total mess. There are also 35 ridings where you may want to vote Liberal for consideration #2 (or, if you're a Conservative, to block the NDP or the Bloc). In the other 160 ridings, strategic voting is not recommended. In the 143 ridings listed below, the difference between the Conservative vote share and the top non-Conservative one is less than 15%. - "Vote X" means that party X is 15% or more above all other non-Conservative options. - "Too close" means that the top two non-Conservative options are within 5% of each other. These options are listed in parentheses. This party is currently the Liberal party. The 35 races below are ones where: i) the Tories are not competitive, and ii) the difference between the Liberal vote share and the top non-Liberal one is less than 15%. 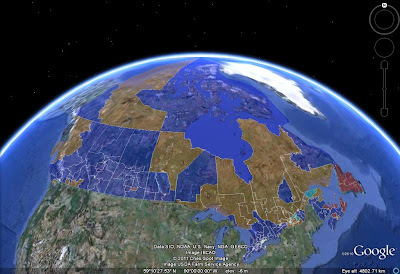 In all cases, you would help defeat the NDP; in Québec, you would also help defeat the Bloc in the starred (*) ridings. Disappointed you would do this Strategic voting nonsense. I think this exercise will be seen to taint your future conclusions. You have been my main man on analysis since I worked with you in 2011, but I shall certainly be more skeptical than heretofore. I'm just responding to demand - numbers suggest that close to 1/3 of the electorate is interested in this. When or not one agrees with strategic voting, one cannot deny that it is an inevitable by-product of our system. If it is just done for fun and not to try to influence, then why not also do a How to Stop Trudeau exercise? Or how to stop "the socialist hordes"? On another topic, have you detected certain --how shall I put it--anomalies in Eric's work since he signed on with CBC? Well, it's done partly for fun, and partly to respond to demand (which I consider different from trying to influence). I could indeed do a stop Trudeau for the former, but I doubt that it would do much of the latter, so motivation is lacking. In my post next week, I'll indeed talk about why some models are much more favourable to the Liberals. It boils down to using proportional change vs. arithmetic change. Eric has always used proportional change (and I've always disagreed with him), so I don't think this has anything to do with the CBC. This choice just happens to have a big effect this election due to how low the Liberals were in 2011. In the past he has used a consistent number of polls to average before projecting. This time, the number seems arbitrary: sometimes it is the 6 most recent polls, sometime 7, sometimes 8. And recently, I noticed that although they were only a few days apart, he gave four times the weight to a Nanos than a Mainstreet with a sample of over 5000. But I shall look forward your discussion of models. Also, I wonder if you could explain the "Turnout adjustment" for people again. I assume it has to do with ages of those polled and the degree of commitment to their preferred party, but should like an amplification. Many thanks. Interesting re: number of polls. Maybe he's trading off time vs. number of polls, i.e. he uses more polls when they're released over a shorter period? Eric uses pollsters ratings, so Nanos is given more weight due to its good track record, while Mainstreet might be suffering from being new to public federal polling. My turnout adjustment is actually quite rudimentary: it basically just assumes that CPC supporters are about 10% more likely to turn out than supporters of other parties, with slightly different assumptions in and outside Québec. 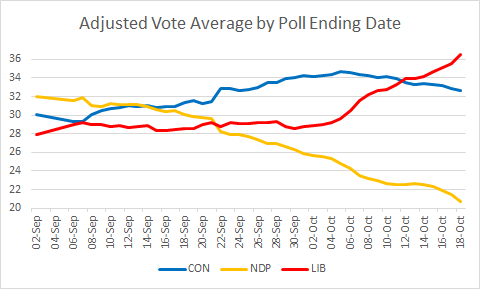 It roughly matches the effect of the Angus Reid Likely Voter model (which is based on factors such as the ones you mention) from its August poll. That is more or less what I thought. Many thanks. I was polled by Angus Reid the other day and was disappointed to find it very lengthy and somewhat confusing which led me to suspect that some people with less education or less political savvy might inadvertently say what they did not mean. At times I felt I was being led where I did not want to go. I was even more disappointed to find some questions were predicated not on fact but on conventional wisdom derived from anti govt. propaganda. For example, several questions proceeded from the statement --as fact-- that federal health care spending had been cut by $36 billion, when it has risen and will continue to rise. Yes, a lot of poll questions are so ill-designed that the results are meaningless. The whole "cut/increase" spending thing should always be qualified by "relative to..." but politicians, pollsters, and many journalists don't bother. The left likes to complain about cuts that are in fact just reductions in the increase, while the right likes to boast about nominal increases even when insufficient to maintain service levels. Both are highly irritating. Great job on the strategic voting site. My only quibble is with your comment on Ottawa-Centre. In this riding Paul Dewar of the NDP will win. No disrespect to Liberal candidate Catherine McKenna, who has run a wonderful campaign, but a liberal vote in this riding is counter-productive if you want to get rid of Harper. Pontiac: Too close to call as it's a Liberal-NDP tossup, but it looks like the Grits will take this one. "At times I felt I was being led where I did not want to go. " Ya think? Polls manufacture consent and undermine the power of the ballot box.